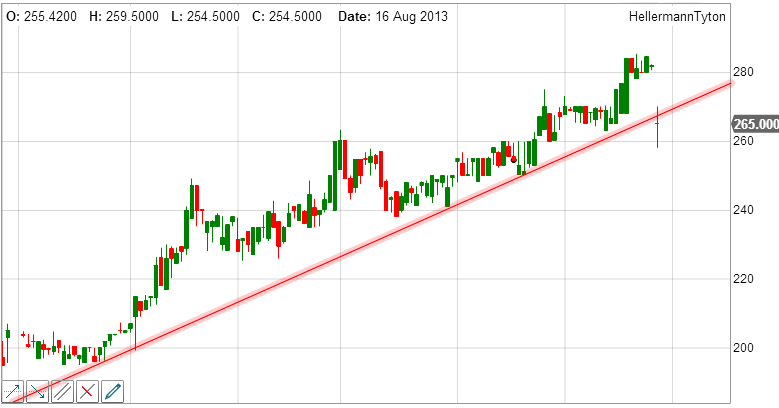 Trend lines are sloping support and resistance lines. They are commonly used to judge entry and exit points in trading. A trend line is formed when you can draw a diagonal line between two or more price pivot (reversal) points. They are commonly used to judge entry and exit investment timing when trading. A trend line is a bounding line for the price movement of a market. A support trend line is formed when a market price decreases and then rebounds at a pivot point that aligns with at least two previous support pivot points or if a channel can be formed by creating a parallel resistance trend line. Similarly a resistance trend line is formed when the market price increases and then rebounds at a pivot point that aligns with at least two previous resistance pivot points or a parallel support trend line. As you can see from this example the price has been in a well defined upward trend, with the resistance line being formed while the price consolidates. A common trading strategy in this example is to open a long position (buy) when the price breaks through the consolidation resistance level. Using timetotrade, alerts can be set up to notify, or execute trades, you when the price breaks through a support or resistance trend line. In this example a possible trading strategy is to buy when the price pulls back to test the lower red support trend line and then sell when it tests the upper blue resistance trend line. 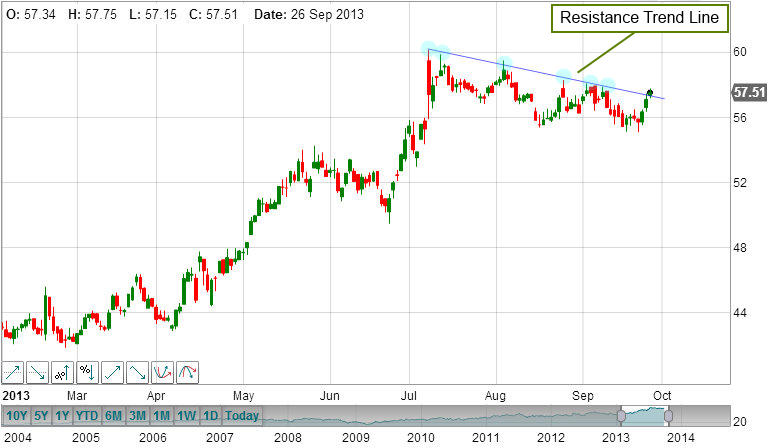 In a bearish downward trend, should the price break through resistance then traders typically close short positions. When establishing trend lines it is important to choose a chart based on a price interval period that aligns with your trading strategy. Short term traders tend to use charts based on interval periods, such as 1 minute (i.e. the price of the market is plotted on the chart every 1 minute), with longer term traders using price charts based on hourly, daily, weekly and monthly interval periods. Trend lines are typically used with price charts, however they can also be used with a range of technical analysis charts such as MACD and RSI. Trend lines can be used to identify positive and negative trending charts, whereby a positive trending chart forms an up sloping line when the support and the resistance pivots points are aligned, and a negative trending chart forms a down sloping line when the support and resistance pivot points are aligned. A common Trend Line trading strategy in bullish markets is to "buy to open at support" and "sell to close at resistance" i.e. buy when price bounces of the support line and sell when the price bounces off the resistance. In a bearish downward trending market, "sell to open at resistance" and then "buy to close at support"
Another strategy used with trend lines is to trade ‘break-outs’ as discussed above. 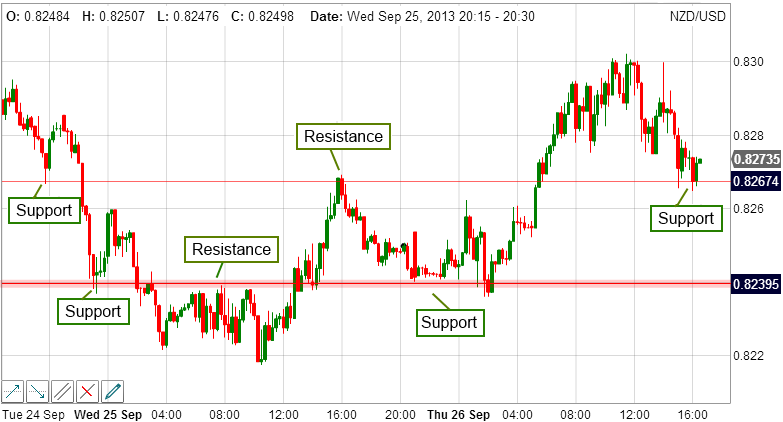 If the market breaks through its support or resistance lines this can signify a change in trend. For example, if the market is in a downward trend and breaks through a resistance trend line, this is considered a bullish move as in such instances the market can increase until a new line of resistance is reached or established. On the other hand, if the market is in an overall upward trend but then price falls below its support trend line, this is considered a bearish move. As with the support and resistance levels, a support trend line can become a resistance trend line if the price of the market falls below the support line. 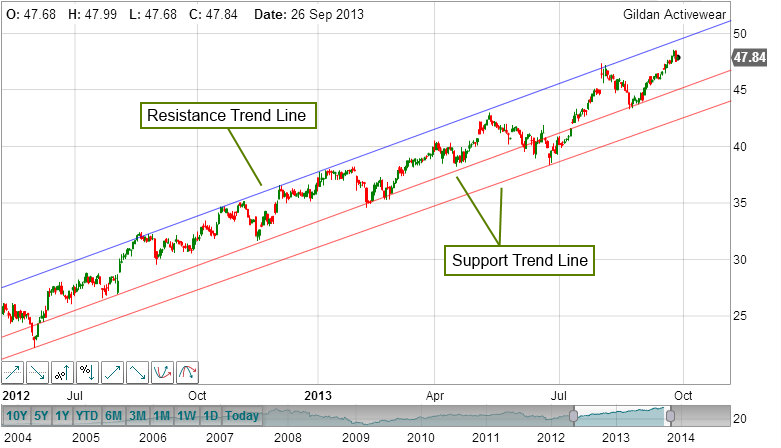 Similarly a resistance trend line can become a support trend line if the price of the market rises above the resistance. Trading support and resistance trend lines and levels is not an exact science. Prices might not quite hit support and resistance levels before reversing and break-outs can be very short lived, providing false signals. For these reasons many traders will use support and resistance ‘zones’ allowing for a margin of error either side of the support / resistance levels. 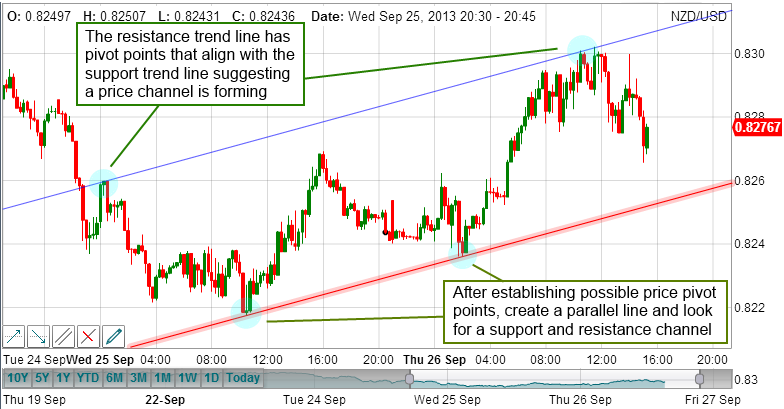 For help on how to use the timetotrade trend line chart drawing tools click here.